Don’t Shout! Use an Intercom! Ever thought about the fact that shouting directions or calling out to someone living under the same roof can be a give-away to burglars? In one instance, a woman in the kitchen was telling her husband at the top of her voice (he was in the basement at the time), that they were the only two people in the house. A burglar walking his beat nearby got an earful including where the two occupants were and nonchalantly opened the front door, took what he wanted and left. So much for yelling info across empty floor space! At SeriousCCTV, we recommend the use of an intercom system. Choice of Flush or Surface Door Mount. 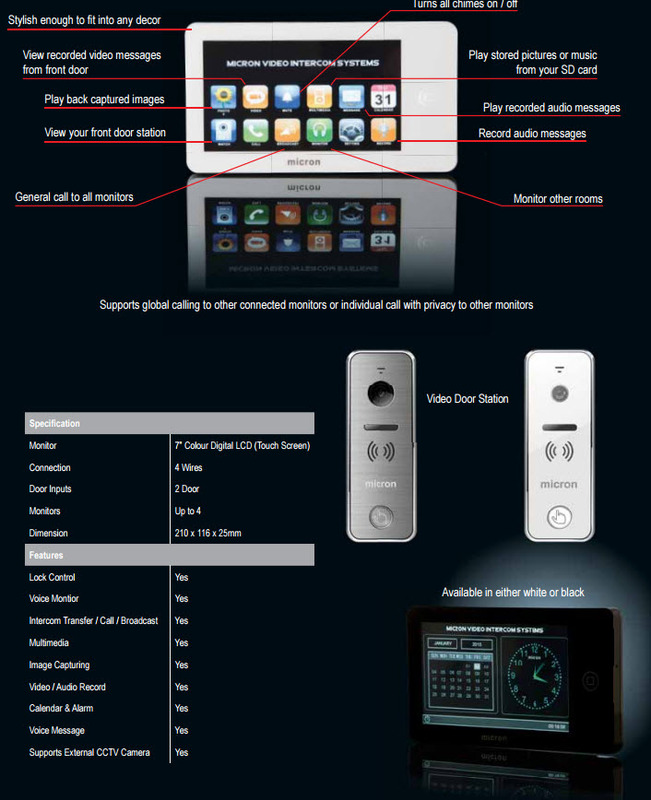 Has memory function – view recorded messages of people who press the door bell. ** Available in either white or black. Door strike / release option – 440 (GST inclusive) additional costs depend on distance of gate from house as underground cabling is required. Demand for the intercom system has gone into high gear lately. Nearly every household in the Australia or NZ is clamouring for one to be installed. The reasons are simple enough as they are easy to install, simple to use and exceedingly effective. Four pluses can be accorded to the intercom system. It effectively connects the front door with the inside of any home. Users can relax as the system operates itself when a wireless doorbell is attached to the intercom system. The activities and movements of children outside can be monitored with telephonic talks between parent and child. There is less hassle and bother when installing a wireless intercom as opposed to cable wiring. It acts as a serious security system with audible speakers that can pass information between users. It allows house occupants to talk or listen to one another from anywhere in the house. It automatically goes into action once the outdoor doorbell rings followed by instantaneous conversation between visitor and occupant. Its speakers can be muted to ensure privacy and monitor the progress of a sleeping baby from anywhere in the house. Believe it or not, many house owners and businessmen believe that the story ends once a system has been put in place and has been activated. Nothing can be farther from the truth as the most serious business of maintaining the system to ensure perfect functioning and repairs to keep the system going now start. For these, you need the help of experts and our professionals have the right credentials to render assistance. We’ve been seriously involved in maintaining and repairing security systems and our track record shows nothing but par excellence. Simply ring us now on (02) 8091 1989 for our free quote and see for yourself how a truly professional provider delivers the goods to your very front door. Intercom Systems – Used Only In the High End Buildings?